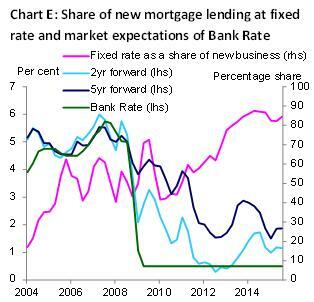 But first, why did the Bank start producing its own monthly mortgage rate statistics? Before the 1980s, the mortgage market was fairly straightforward, with each mortgage provider offering an SVR (or standard variable rate). But, during the 1980s and 1990s, the mortgage market became more competitive and dynamic, with the introduction of more complex products. Fixed-rate mortgages were first introduced in 1989. Flexible mortgages (such as those which allow borrowers to offset their loan with savings) became popular in the mid 90s, as did discounted variable rates offering a rate below the SVR for the first few years of the mortgage, and trackers which remain a certain number of basis points above Bank Rate. Also, when the Bank was granted independence by the government in 1997, mortgage rates statistics were needed to monitor the transmission of monetary policy. So, the Bank began to compile and publish average interest rate statistics: quoted interest rates data from 1995, and effective interest rates data from 1999. Quoted rates represent average end-month mortgage rates advertised by lenders. The lenders are selected to cover 90% of the market, based on balance sheet data on secured (or mortgage), retail lending. For each mortgage type, one product is selected per lender. Why not just take an average of all the products the lender has? Well, the aim of quoted rates is to find the lowest rate available to the average borrower. That means excluding products which are only available to first time buyers or remortgagers, or products for high value loans, for example. Once products are selected, we ensure their contributions to the average are representative by weighting each rate by the institution’s amount of new mortgage lending. This ensures that a lender with a very low rate but very small amount of lending does not skew the average. Quoted rates are collected for a wide range of mortgage types, at different fixed and variable terms, and at different LTV (loan to value) ratios. So these are the best rates available to the average Joe, but that doesn’t mean Joe is offered, or chooses them for his mortgage. And while quoted rates tell us the best rates available now, they don’t give us information about the rates people are paying on mortgages taken out a year or more ago. For that, we have the effective rates data set. Effective rates represent the rates actually experienced by borrowers, based on monthly lending volumes and interest flows. The sample of lenders is the same as for quoted rates. 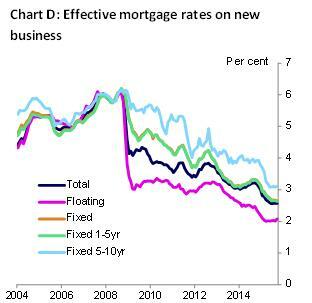 Effective rates cover back book mortgage rates (‘outstanding’) and new business mortgages. The rates are split into fixed and floating rate mortgages, with some detail as to the type of floating rate product and fixed term. The Bank does not publish the lending balances reported in our effective rates data as specifically collected volumes data are published separately in Bankstats tables A5.2-A5.5. 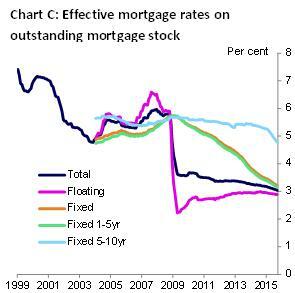 But we are interested in the distribution of lending – the share of mortgages which are on a floating rate, for example. If the majority of borrowers are on a floating rate mortgage, monetary policy will impact mortgage interest payments more quickly. What can we learn from quoted and effective mortgage rate data? 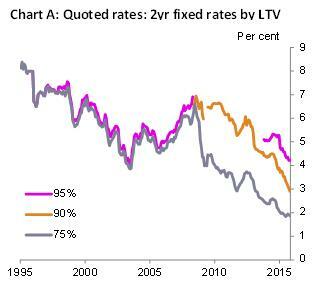 Before the 2008/2009 crisis most quoted mortgage rates were offered up to 95% LTV. But since then mortgages have been priced according to LTV, leading to a wider range of rates (Chart A). For a time, 95% mortgages were so rare that it was not possible to publish a rate, and instead a new series of 90% LTV rates was produced. 95% LTV rates have become more widely available since the Help to Buy Mortgage Guarantee scheme was launched in 2013. 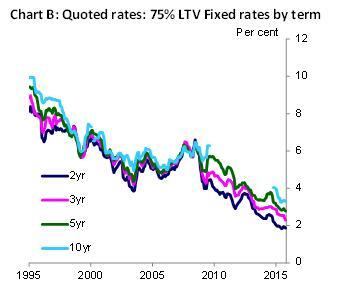 The range of rates by term has also widened since the crisis (Chart B). For several years, due to lack of availability, the 10yr fixed rate mortgage rate was not published, but the series began again in October 2014. The mortgage market review encouraged greater availability and popularity of longer term fixes, which boosted product numbers. Leading up to the crisis, effective stock mortgage rates (Chart C) moved in a fairly narrow band, but with the cuts to Bank Rate in 2008, floating rate mortgages were priced substantially below fixed rates. Floating rates include SVRs, which respond quickly to changes in Bank Rate, but do not see rapid turnover. Stock fixed rates were slower to react to changes in Bank Rate, but because of the regular turnover of borrowers remortgaging at lower rates, the stock average fixed rate has fallen over the past five years. The wider spread of rates in recent years is also apparent in the rates for new business (Chart D). Mortgage rates have been gradually falling, and since September 2014, a ‘mortgage price war’ has driven rates to historical lows. Within the new business distribution data (Chart E), we see that fixed mortgages accounted for between 40-60% of the total until mid-2012. Then, it shot up and now is between 80-90%. One factor that may have driven this is expectations of Bank Rate increases. In Chart E, which also shows the forward yields series used in the Inflation Report (Bank Liability curve and Overnight Indexed Swaps), we can see the market expectations of Bank Rate in two years time and in five years time. After Bank Rate was cut during the crisis, expectations of future Bank Rate also fell, to a low point in 2012. After that, market expectations began to rise due to speculation of a rate rise. Around this time, a larger proportion of borrowing was at a fixed rate mortgage, as mortgagees guaranteed themselves against future Bank Rate rises (at least for two or more years). Market expectations have since fallen back again, while the share of mortgages being fixed has stabilized at a higher level. Finally, what can average mortgage rates tell us about other data series? Quoted rates may not relate closely to mortgage approvals (just because the mortgage rate has fallen doesn’t necessarily mean a borrower will have their mortgage approved). But we might expect some relationship with mortgage demand. 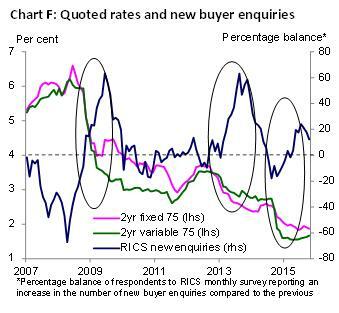 From 1999-2006, the correlation between the level of 2yr fixed 75% LTV rates and RICS (Royal Institute of Chartered Surveyors) new buyer enquiries balance was practically zero. The RICS series was fairly volatile over the period and did not respond to movements in mortgage rates. However, from 2007-2015, the correlation is stronger, at -0.5 (as rates fall, enquiries rise), suggesting that borrowers are more price sensitive since the financial crisis. It would be naïve to treat enquiries as independent from other conditions in the market such as house prices, but the relationship between rates and enquiries can be seen in Chart F, where in three periods of mortgage rate falls (08-09, 12-13, and the mortgage price war), an increase in the RICS new buyer enquiry balance has followed. These are just a few threads that can be pulled out of the average mortage rate data we publish on the Interactive DataBase and in BankStats tables G1.3, G1.4 and G1.5. For a look at an extremely long run mortgage rate series, check out this BankStats article. Hannah Phaup works in the Bank’s Research and Statistics Division. Previous Post How did the Bank’s forecasts perform before, during and after the crisis?